Our shop is growing! We'll be welcoming our first little one this February. We couldn't be more thrilled! Part of the preparation and fun is getting to design and print our own shower invites and we sure had a blast doing it. We've decided to wait to find out our baby's gender and we'll also be having separate gatherings for family and friends. 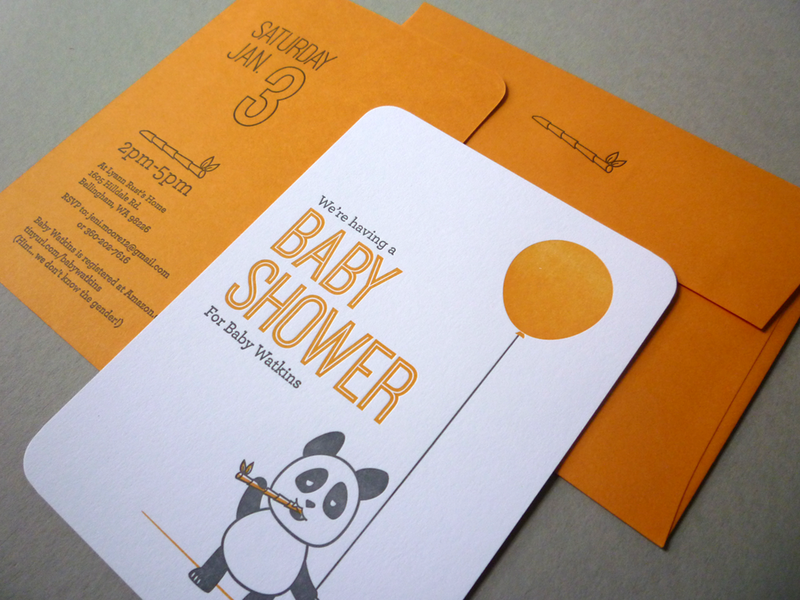 For a gender-neutral invite, we went with orange and gray and decided on a two-sided duplex design to accommodate info for multiple showers with two different backs. I've been really liking how French Paper performs on the press and have been looking for an excuse to use Orange Fizz. This was the perfect project to use French Paper's Sweet Tooth for the front and Orange Fizz for the back. Mixing custom ink colors in-house, we matched the orange ink to perfectly match the paper. After printing the front and two versions of the back, we duplexed the two 100# paper stocks and cut them to sized. The resulting 200# invite card makes for a very sturdy piece. With a bamboo accent printed on the French envelope flap, these guys are ready to ship!